Academic and research libraries form the social "heart" of a campus; they have become centers of knowledge creation, facilitating both individual study as well as collaborative learning. Undergoing constant re-evaluation, libraries help define contemporary student culture as places of convergence where collaborative work and study, and social engagement continue around the clock. 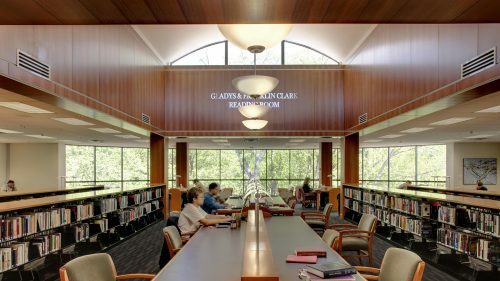 The planning of academic libraries must accommodate and support widely varying patterns of use, from solitary, quiet study to active group study and project areas. Their success relies on creating an appropriate scale of spaces, flexibility that enables future adaptability, and internal organization that supports collections management, service operations, and the efficient use of staff resources. Learning environments in libraries and as free-standing academic classroom buildings, have been subtly and purposefully shifting as institutions evaluate their new roles in our knowledge-driven economy. It is important for each institution to investigate its own successes; to determine how far to emphasize experimentation, welcome diverse learning styles and evaluate pedagogical alternatives for instruction and learning. JMT's architects are actively leading this evaluation, inviting dialogue and modeling to define learning environments that empower institutions to pursue their mission and achieve their goals.